Responsible Pest Management—A Continually Evolving Challenge! Protecting precious crops from hungry insect pests has been one of the greatest challenges to farming since the development of agriculture. Until the introduction of synthetic insecticides in the 20th century, there was little that could be done. For many years, farmers lived in fear of losing their entire crop to disease or plagues of hungry insects. Almost 2,000 years ago, Pliny the Elder mentioned burning “brimstone” (sulfur) as a fumigant to kill pests, and since then a wide array of unlikely chemicals have been employed to combat crop loss, including salt, pepper, tobacco, vinegar, turpentine, fish oil, arsenic, copper, lime and many others. It wasn’t until Swiss scientist Paul Müller developed DDT during World War II that we had our first highly effective, man-made insecticide. Not only did DDT contribute to the dramatic increase in agricultural productivity during the 20th century, it also spared millions of people from the ravages of insect-borne malaria and typhus, and Müller was awarded a Nobel Prize for his work. Unfortunately, in the following decades it became clear that DDT and other subsequently developed insecticides could accumulate in the environment and cause serious harm to non-target organisms, including wildlife and humans. In response, many farmers began using a variety of tactics to reduce the usage of insecticides while still controlling damaging crop pests – strategies that came to be known collectively as Integrated Pest Management or IPM for short. At the same time, the U.S. Environmental Protection Agency began to encourage the registration of new classes of insecticides which were termed “reduced risk” and posed little or no threat to beneficial, non-target organisms. The first class of plant-inspired insecticides to be developed were the synthetic pyrethroids, similar to the natural chemical pyrethrin found in Chrysanthemum flowers. Pyrethroids are now commonly used in household insecticide sprays and many commercial products. But the real game-changer was the neonicotinoid class of insecticides, developed in the early 90’s and chemically similar to the nicotine found in tobacco. Colloquially known as ‘neonics’, this new class of insecticides were safe for humans and many beneficial insects and were also extremely effective in controlling pests. On potatoes, just one extremely low dose treatment applied at planting could protect the plant through most of the growing season. With this unprecedented combination of efficacy and safety, neonics quickly became the gold standard in crop protection for potatoes and other staples such as corn, canola and soybean. As we learned in our last blog, however, this widespread use proved too good to last. 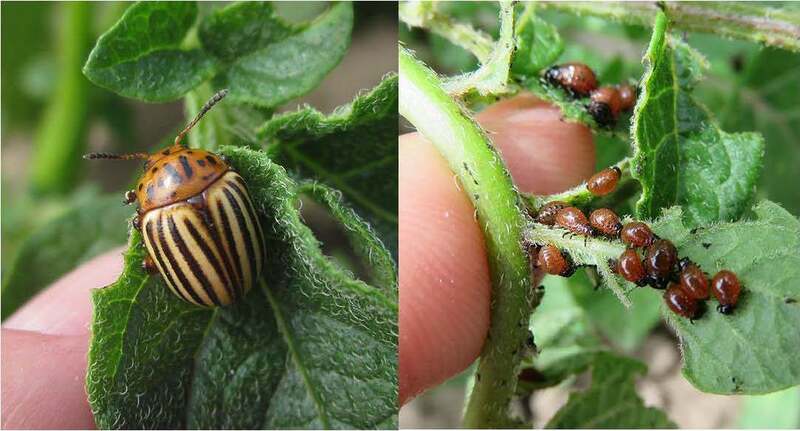 Several insects, including the notoriously adaptable Colorado potato beetle, have now developed some level of resistance to neonics, and new strategies are already being developed to stay ahead of the pests. Insecticide resistance is not the only emerging problem with neonicotinoids. Neonics are highly soluble in water and are readily taken up by plant roots to systemically protect the entire plant. Inevitably some of the insecticide will not be absorbed and can remain in the soil, and there is potential for rainfall to leach it into groundwater. As mentioned previously, this is not a new problem—environmental accumulation spurred the search for less toxic alternatives to DDT and its successors. In Wisconsin, the Department of Agriculture, Trade, and Consumer Protection (DATCP) actively monitors for the presence of agricultural chemicals in our state’s groundwater to ensure that if contaminants reach the water, they remain at acceptable levels which pose no threat to human health. In 2008, DATCP added neonicotinoids to the list of chemicals it tests for in groundwater monitoring wells, and trace amounts were detected in many wells. Currently there is no EPA standard for acceptable levels of neonicotinoids in groundwater because they pose very little threat to humans, but their presence has spurred new research funded by potato growers to determine the extent of the problem and search for possible solutions. In the Central Sands region where most of Wisconsin’s potatoes are grown, Ben Bradford, a graduate student in the University of Wisconsin’s vegetable entomology program, is building on these findings by conducting extensive sampling of irrigation water in grower’s fields to determine the extent of neonic incursion into groundwater. In cooperation with vegetable growers, Ben has found that, although contamination is relatively widespread throughout the vegetable production region, it is currently found only in very low amounts, thousands of times below levels that would warrant action by the EPA. Interestingly, these results have also shown that the amount of contamination detected can vary considerably from one field to the next, and from one year to the next, revealing the dynamic nature of groundwater in the Central Sands. By using satellite imagery and advanced mapping software, it may be possible to determine some of the contributing factors to these neonic detections and to work with growers to tweak their pest management strategies to mitigate this problem. This research is yet another great example of the UW and the potato growers working together to define the extent of an emerging problem and move quickly to develop solutions.